Full sessions are carefully planned to fit your personality and vision and take place at a custom selected location. Each photo session lasts between 2-3 hours, depending on the type you chose. Session fee books the photo shoot and includes a consultation meeting, session planning and the photo session. Our consultation meeting takes place a few weeks before the session. During the meeting we plan your outfits, location and make-up. Session fee does not include digital files or prints. Print and digital collections, as well as a' la carte choices are available. $450 - On Location & Studio Session (up to 3 hours). $650 minimum investment. A great alternative for those on the go or on a budget, mini sessions are offered 8 times a year at predetermined locations. Mini-session fee includes a 20 minute photo shoot, 5 fully edited and color corrected images, a 5X7 print and a downloadable online gallery. No minimum investment is required. To view the upcoming dates and locations and book click here. Minimum investment is met by ordering digital images and/or prints. Please, email me for a PDF of digital and print packages. Most seniors invest between $1,200 and $2,500. If you ever wanted to be on the set of a fashion shoot, this is for you. Each year, I offer 3 full-day editorial sessions. You can chose from a beauty or a fashion shoot. As an option, you can also model together with a friend for even more fun! Bring your favorite Glamour, Seventeen or Vogue issue for inspiration! We will create 5-6 pages of fashion or beauty story, each with a different outfit, hair and make-up. This is for girls and guys who love being in front of the camera! After styling, we shoot on location or a studio for up to 5 hours. The session includes an initial consultation; brainstorming to chose a theme, props, clothes, a story line and a location; professional hair/make up application with up to 5 hair and make up changes, and 5 outfits styled by a fashion stylist on the set. Destination photo shoots are also available and are perfect for Spring Break and Summer. If you are interested, please, inquire for details. 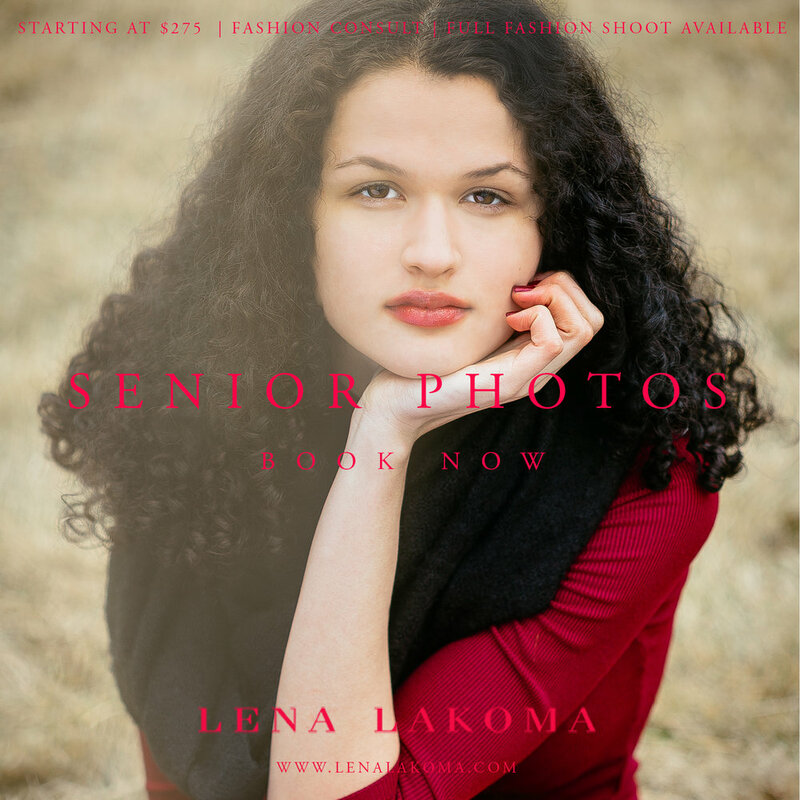 Session fees start at $1,200 with a minimum investment of $2,800. Due to an involved nature of this photo shoot, we need a minimum of 3 weeks between the booking and the shooting date. Where will you take pictures? I know a lot of cool locations and tailor the final choice to each senior's style, vision and personality. We work together to come up with a story and the location that fits it. Whether it's urban cool, modern and elegant, or natural and romantic, we will find the perfect spot. Studio sessions will take place at my Northeast studio. Should I hire a hair and make-up artist? Make up is an important part of a photo shoot. Make up artists are trained to understand facial features, how to accentuate what is beautiful, hide imperfections and make everything work together with a given light. They advise, they listen to your vision and execute it flawlessly. They've been blending eye shadows and studying mascara techniques for years! As a perk, professional, long lasting products they use, stay in place for the entire shoot. I work with a team of super talented makeup and hair stylist who do a fantastic job. Within 7-10 days after your session, we will send you a gallery for you to view. After styling and choosing the outfits, we will shoot for about 2 hours ( depending on the package), with unlimited outfit changes that you bring with you. You don't have to chose between your skinny pants and your prom dress. We will shoot both! Choose your themes, bring your heels and sunglasses and get ready to roll! How do I book a Full Session? Book your session here. Your fashion and planning consultation is included in the session fee and you will be able to schedule your consultation upon booking the session. Book your 30 minute fashion and planning consultation here. We will meet at my studio and if you decide to book with us, the $50 consultation fee will be applied towards your booking. To book and learn more about my mini sessions click here.